Google Page Creator, the free tool that lets you build simple web pages without knowing HTML, has received a small update. Until today, the only thing you couldn't delete from a web page was the homepage, but now you can delete it too. To delete an entire site, you can select all the pages and remove them. Unfortunately, you'll have to delete the uploaded files one at a time or hide the site in the settings. But even if you delete everything from the web site, there's no way to delete the site itself. Another improvement is that any page can become a homepage, so you can have multiple potential homepages. 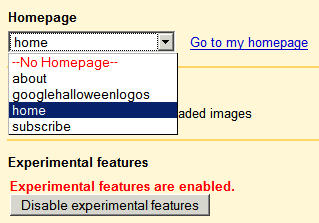 To change the homepage, go to the settings and select one of the pages you've created from the Homepage option. It would be nice to see more features in Google Page Creator that could make it a part of Google Docs: collaborative editing, site search, folders, custom templates. Apparently the delete options are the most difficult to add. Gmail only added a delete button last year and Google Page Creator still doesn't let you delete the site. how about a contest to check out the best exploitation of google page? How can I make one of my uploaded html file a Homepage? i don't want google for my homepage. i'm happy with msn. please remove google now or I['ll sue. I did not ask you to do this!!!!!!!!!!!!!!!!!! Margaret --glenburn27@bellsouth.net Please help me to get rid of the google toolbar and GOOGLEHomepage--I DO NO WANT IT!! where's the easy way to change from having google as home page. I was fool enough to agree to Google being my homepage and now I'm unable to use the "Back" facility when I surf the net. I want to delete Google as my home page?How do I do it?